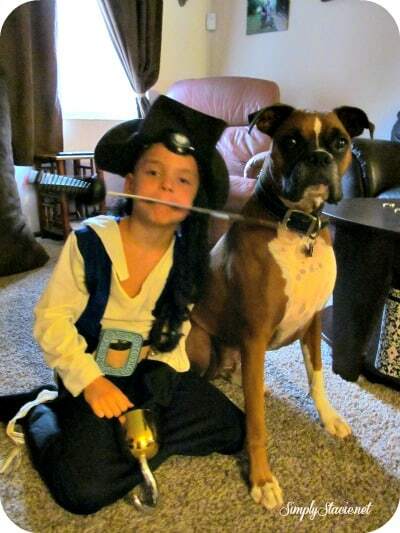 “Get ready to walk the plank!” said the three young swashbucklers who invaded our home and dognapped our boxer, Jack for ransom. My children love to dress up and role playing as pirates is one of their favorite activities. 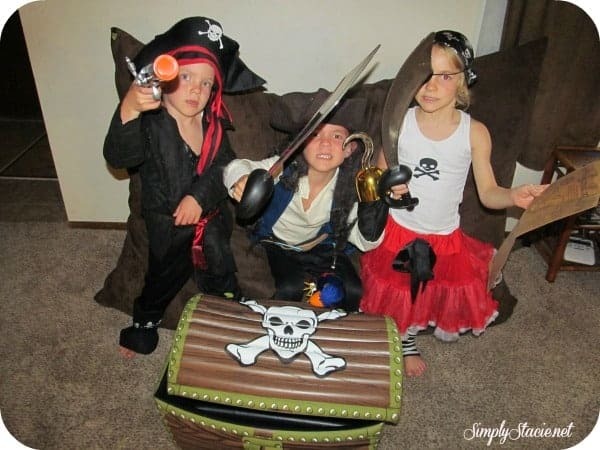 At BuyPirateCostumes.com there is a wide range of pirate costumes and fabulous accessories for adults and children to choose from in great prices for virtually every budget. For pirate dress-up, BuyPirateCostumes.com can’t be beat in my opinion. My eldest son dressed up in costume as his favorite character, Captain Jack Sparrow. His little brother joined the pirate band as an “El Capitan” and never one to be left out, my fearless daughter looked adorable in her girl’s pirate tutu costume. They have had a blast playing pirates for hours on end and the selection of accessories from BuyPirateCostumes.com is excellent. They love donning their eye patches ($2.99) and Pirate Hook ($4.99) while “battling” with the Deluxe Pirate Cutlass and Pirate Pistol ($4.99). Meanwhile, my daughter guards the Treasure Map and her “jewels” hidden in her Pirate Treasure Chest Purse ($14.99) that is packed full of shimmering treasures. I love the adorable Stuffed Parrot Pirate ($8.99) who sits perched on my little pirate’s shoulder as a favorite pirate “pet”. My favorite pirate accessory is the Inflatable Treasure Chest Cooler ($18.99) which can be used as a cooler or as a storage spot between play for all the fun pirate accessories and costumes. It has a lot of room and I find it has been very durable during numerous play times. BuyPirateCostumes.com has a great selection of costumes and accessories at affordable prices. Pirate costumes are fun for role playing and perfect for both adults and children for Halloween dress up. You are invited to visit BuyPirateCostumes.com to browse the entire product line and select your favorites. Now, if you will please excuse me…….I must go and rescue my boxer from the clutches of these pirates!